Setsuyo Astec welcomed 209 visitors, representing 105 of our FA equipment and power distribution equipment distributors, major machine manufacturers, and end users from across East and Southeast Asia at the System Control Fair (SCF) 2017/Measurement & Control Show 2017 held at the Tokyo Big Sight in Japan for three days from November 29 to December 1. 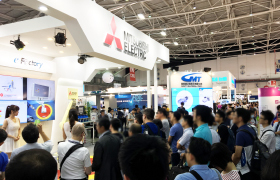 Our staff members guided them around booths—with Mitsubishi Electric booth as the highlight—and exhibited products. Held together as a major exhibition of cutting-edge technologies for automation and measurement, the events showcased a diverse array of products, technologies and services related to the concept of “Monodzukuri (Manufacturing) IoT” this year. Focusing on the company’s e-F@ctory, a more advanced practical solution that utilizes state-of-the art technologies, Mitsubishi Electric received positive feedback from our distributors and end-user visitors. Promotions on Mitsubishi Electric FA and power distribution-related products and services gained extremely favorable responses as well. We would like to thank everybody who visited these exhibitions. Our group operated a booth showcasing our UVC-LED and other related products at the BioOpto Japan 2017 exhibition held in the Makuhari Messe, Chiba, in October 2017. This international exhibition, focusing on products related to optical instruments, was held in great success with the participation of approximately 270 companies and organizations. Our group jointly operated a booth with High Power Lighting Corp. (HPL), a UVC-LED package manufacturer from Taiwan selling products under the BIORAYTRON brand to showcase UVC-LEDs and related products (power sources, heat sinks, etc.) used as light sources for medical care and inspection applications and other purposes. The product presentations were carried out in an easy-to-understand manner with the use of catalogs and demonstration equipment, all of which was highly acclaimed by the representatives of LED irradiation unit manufacturers and other visitors to the booth. Operating a booth at the exhibition left us in an upbeat mood enhanced by the deep interest the many visitors showed with regard to the UVC-LED products and other related products manufactured by HPL. With the increase in demand, expectations are running high for expanding the use of UVC-LED products as light sources in the fields of medical care and inspections, as opposed to conventional UV-LED products that are used for industrial printing and resin curing purposes. Our group will continue with its business activities, in line with our company’s motto of “Improving Customer Satisfaction,” into the future. We Setsuyo Enterprise Co., Ltd. participated in the Taipei International Industrial Automation Exhibition and the Smart Manufacturing & Monitech Taiwan 2017 (Monitech Taiwan 2017) held in Taipei in September 2017, at which we introduced practical solutions, in line with “the Smart Machinery Development Program” being promoted by the Taiwanese government, through the “Mitsubishi Electric e-F@ctory”. The Taipei International Industrial Automation Exhibition featured booths operated by more than 350 companies exhibiting their latest products, including robots and auto-controlled facilities, based on the concepts of “Smart Factory” and “Industry 4.0”. Monitech Taiwan 2017, an exhibition on management and monitoring system, remotely operated technologies and other such equipment, showcased products and manufacturing facilities incorporating next-generation technology. The event was held in conjunction with Touch Taiwan 2017, an exhibition on touch panel and optical film. 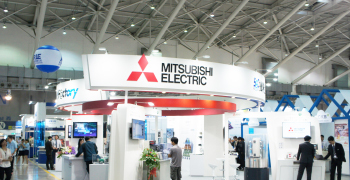 On both exhibitions, our company presented FA equipment manufactured by Mitsubishi Electric and its related partner products. Our clear and well-detailed product presentations using demo units earned us positive reviews. The events ended on a favorable note. We would like to thank everybody who visited our booths. Mitsubishi Electric Factory Automation Systems Group and Setsuyo Astec presented sets of technical training materials of their Mitsubishi FX-PLCs, HMIs-GOTs, inverters, and AC servo motors to the Mongolian University of Science and Technology (MUST) on April 24, 2017. The donation ceremony was attended by university officials including MUST President Baatar Ochirbat and students currently enrolled in the university. The grand event was graced by the presence of Keigo Yamamoto,Chief of the Culture and Public Relations Section of the Embassy of Japan in Mongolia; Makhbal Batbold, General Director of Erchim Engineering LLC, partner company for this project; and news media personnel (TV and print). Several people from Mitsubishi Electric and Setsuyo Astec also took part in the event. The Mongolian University of Science and Technology, which is located in the capital of Ulaanbaatar, is the leading technological university in the country. By providing both theoretical education and practical training, MUST produces competent technical experts and contributes to the development of the industrial sector in Mongolia. This has been the third time the university received Mitsubishi Electric FA equipment since 1995 and 2002.